We try to capture the beauty of the Japanese remote islands through our photography to help tourism in these remote areas. The population flow into the over-populated big cities is still increasing, especially to Tokyo which is a big problem for Japan. 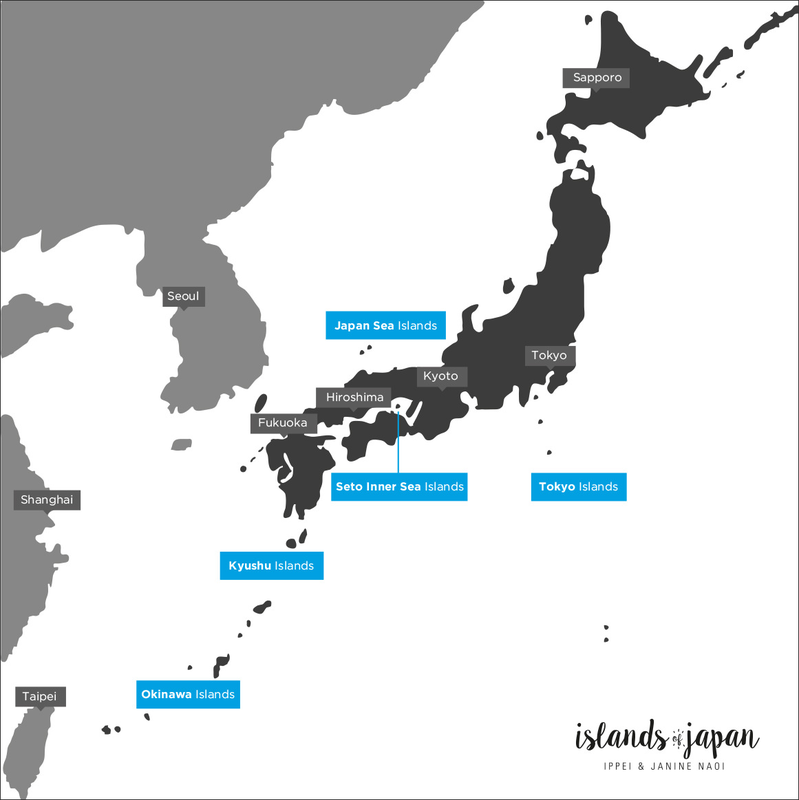 There are 6,852 islands in Japan, and about 500 of them used to be inhabited before WWII. But now only 421 islands are inhabited. We have covered just a small selection on this website. So just to get you orientated, the map below gives a bit of a guide to the locations. There is a lot of beauty in Japan, from cultural beauty to natural beauty. And some not so beautiful areas. The housing of locals on many of the islands in Japan tend to fall into the not so beautiful category, for a few reasons. As with the many parts of Pacific Asia, Japan is often severely beaten by typhoons. In recent decades typhoons have been getting stronger and more frequent, so many people live in ugly concrete housing. They are cheaper to build than traditional housing, and they are more durable and easier to maintain. Many people believe that as they are surrounded by beautiful nature anyway, there is little point putting great effort into gardens due to the frequency of typhoons, and the low income status of many people on these islands makes it difficult to beautify their gardens. Places which receive government funding for cultural or natural heritage, such as Taketomi Island, are different. Islands like this have income solely from tourism, whereas many other islands have other means of income, such as fishing or agriculture. Those who are visiting Japan as tourists are entitled to special fares with ANA (All Nippon Airlines) and JAL (Japan Airlines). One-way direct flight fares are as low as JPY10,000 regardless of flight distance. The fares are released twice yearly: Flights are announced late February/early March (for travel early April – late October), and announced early-mid September (for travel late October – late March). Bookings can be made up to 3 days prior to the scheduled flight, but we recommend booking early. You can hire a car cheaply in Japan if it is reserved in advance. An International Driving Permit (IDP) is essential if you do not hold a Japanese license. It must be the Geneva-convention type which has the Japanese translation page (please note that the Vienna-convention type does NOT have the translation page and will not be accepted in Japan). An IDP is an identity document that allows the holder to drive a private motor vehicle in any country that recognises IDPs. To be valid, the IDP must be accompanied by a valid driving licence. The IDP must be arranged in your home country prior to departure, and usually lasts one year. Nationals of Switzerland, Germany, France, Belgium, Slovenia, Monaco, Estonia and Taiwan; You cannot obtain the Geneva convention International Drivers License (which is accepted in Japan), so you need to get a translation of your license through JAF (Japan Automobile Federation). You can do it yourself once you arrive in Japan by visiting a JAF office in person (which may take some time), or if in advance you will have to ask someone in Japan to do it for you, or use an online service such as ours. Please note that places such as Ishigaki Island do not have a JAF office. For those who are looking for outdoor day trip destinations from central Tokyo, check out our Tokyo Outdoor Day Trips for river hiking, stream trekking and kayaking. For fly fishing/tenkara combined with stream trekking around Tokyo, check out Isaac’s website for some inspiration. Maybe you can also join his expedition!